REFLECTION – Click on image to enlarge or to order giclee prints. I have always liked the concept of trying to put myself in someone else’s shoes in order to better understand the basis of their emotions and actions. 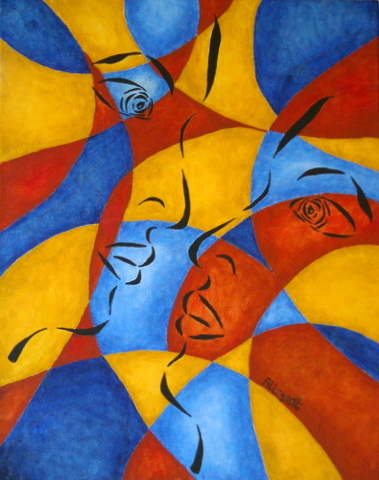 In this painting I wanted to delineate two abstract profiles that demonstrate the idea that when we are fleshed out and outwardly adorned we are all unique. But under the costumes and grease paint, we are one. This entry was posted in abstract art, Art, minimalism art, original art, Uncategorized and tagged abstract art, acrylic painting, allegretto, allegretto art, art, blue, caligraphy, color, complimentary colors, contemporary art, decorative art, funky art, geometric art, gold, modern art, original art, pam franz, pamela allegretto, red, shapes. Bookmark the permalink.